Normally this blog is about getting kids out into nature, but on Thursday we had the chance for a different kind of hike. 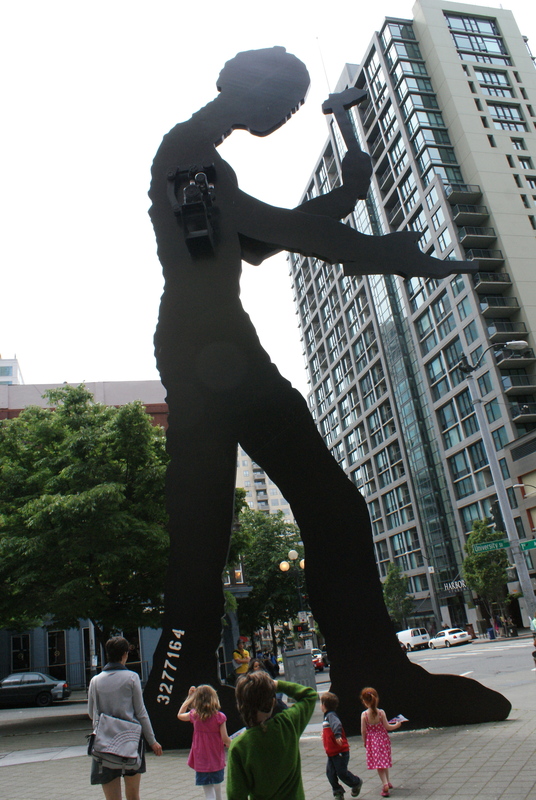 The good folks at ParentMap asked me to review the brand new kid’s walking tour of Seattle put on by the company Seattle by Foot. We began our adventure by taking the bus downtown (so we wouldn’t have to worry about parking.) 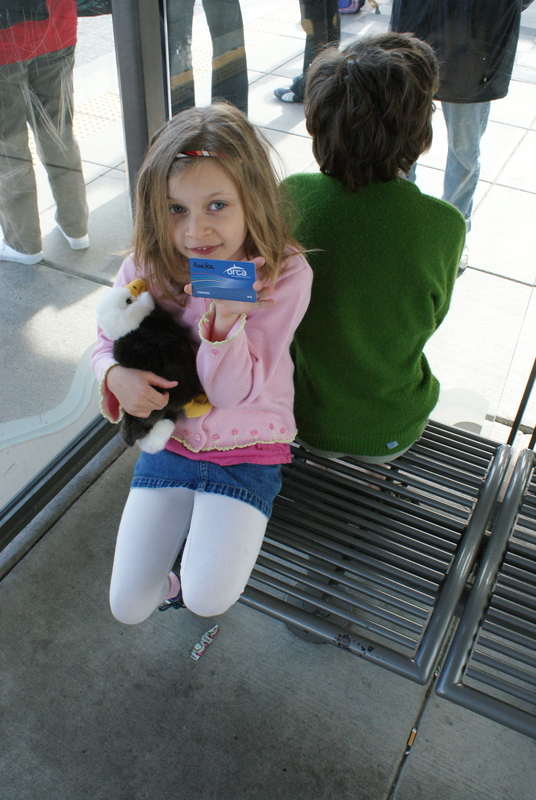 Annika is 6 now so we got her her very own Orca Pass to ride public transit. 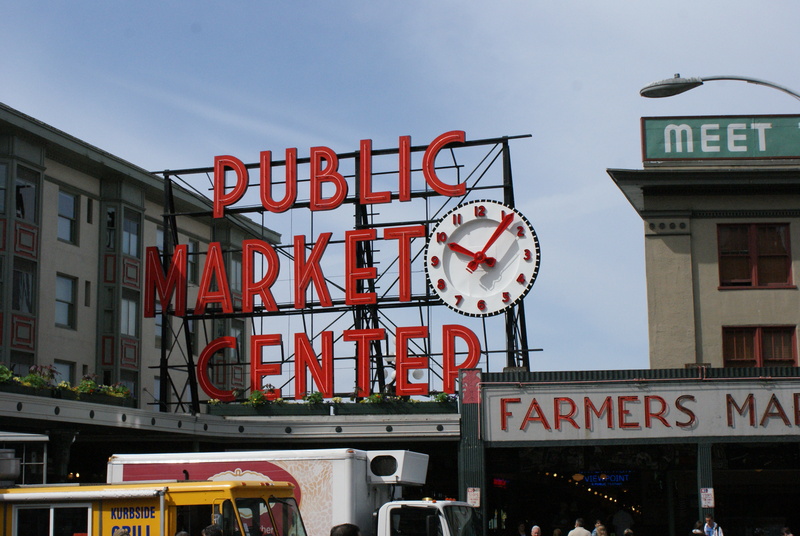 under the iconic market sign, to wait for our tour guide, Jennifer Dopps. Right on time she showed up with a sign, and we waited for the rest of the group to arrive. We were joined on our tour by the owners of Seattle by Foot, Heather Chermak and Penny Truitt. Heather’s son Kyle was also with us, and two other families with youngsters rounded out our tour contingent. Jen learned all the kids’ names immediately, and had them involved in conversations about their interests. 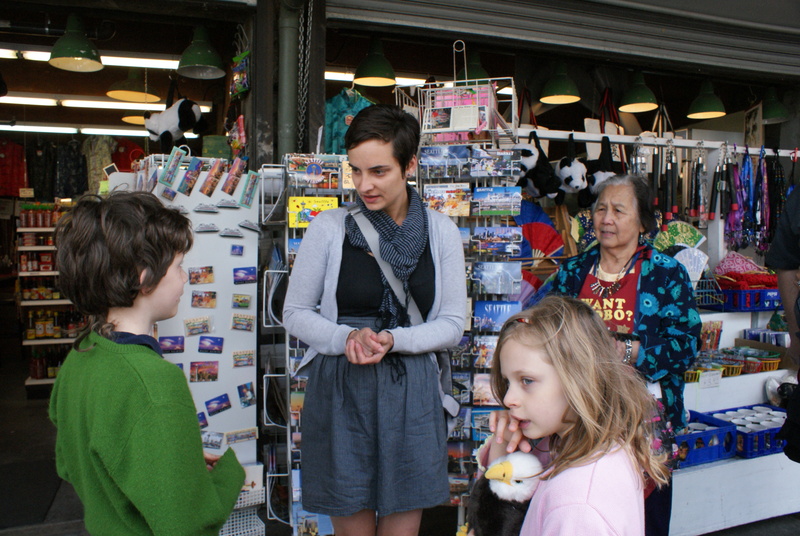 The first part of our tour involved learning about the Pike Place Market’s beginnings, and going to meet some of the shop keepers. 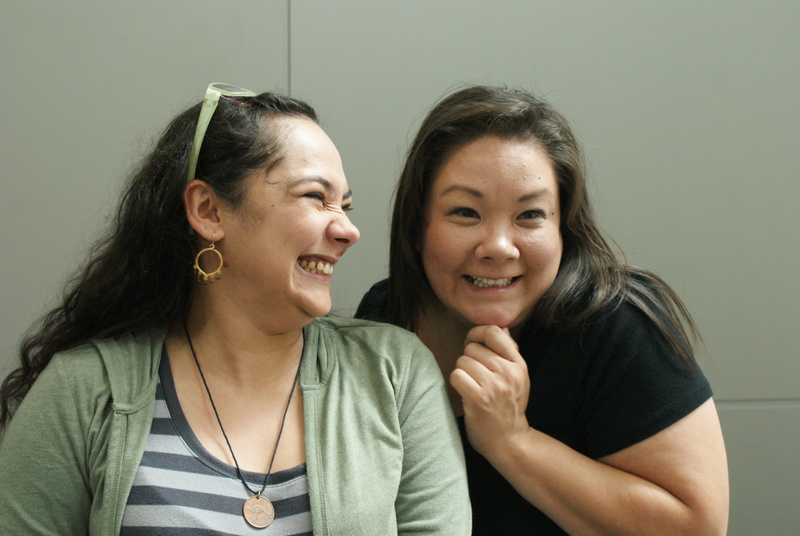 We met the owner of Oriental Mart, an Asian Market that is run by 3 generations of women. It’s been in business for 42 years! They gave us a little goody bag, and we moved next door to Choice Produce and Peppers. 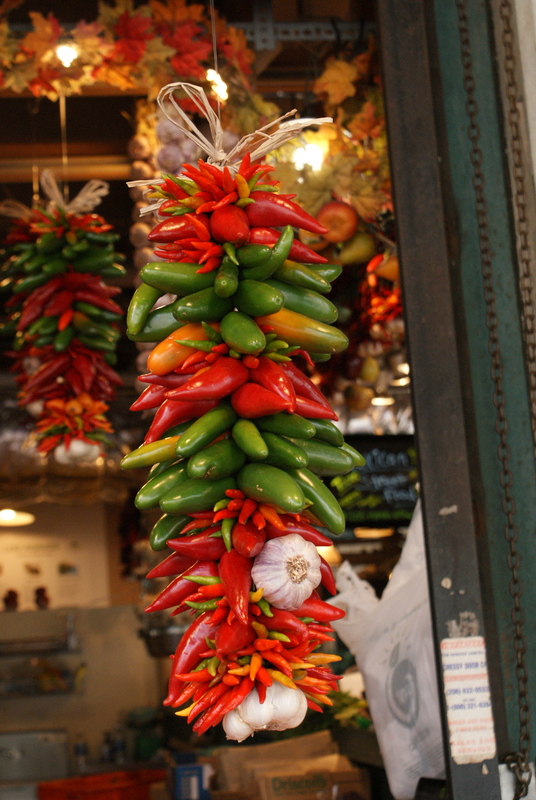 They had scrumptious produce on display, including vibrant pepper and garlic strings. 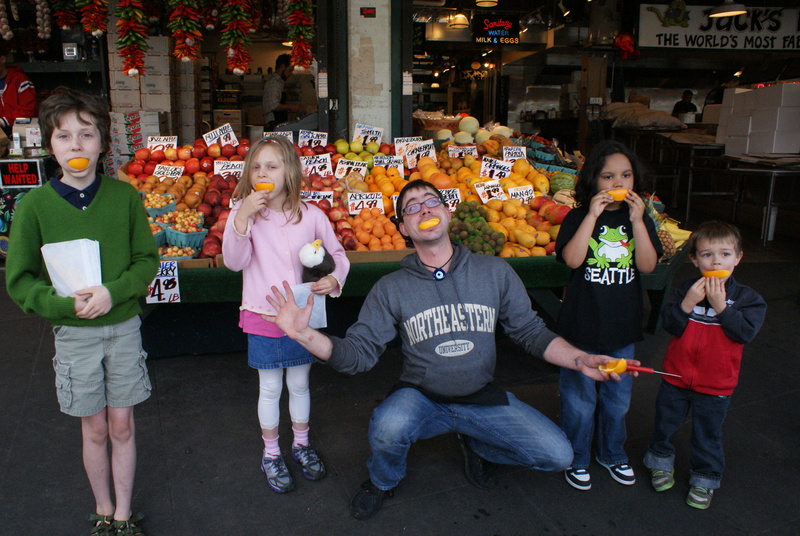 We learned about some of the produce of Washington, and a fellow named Swan came out and entertained us and gave us a taste of some of his fruit. 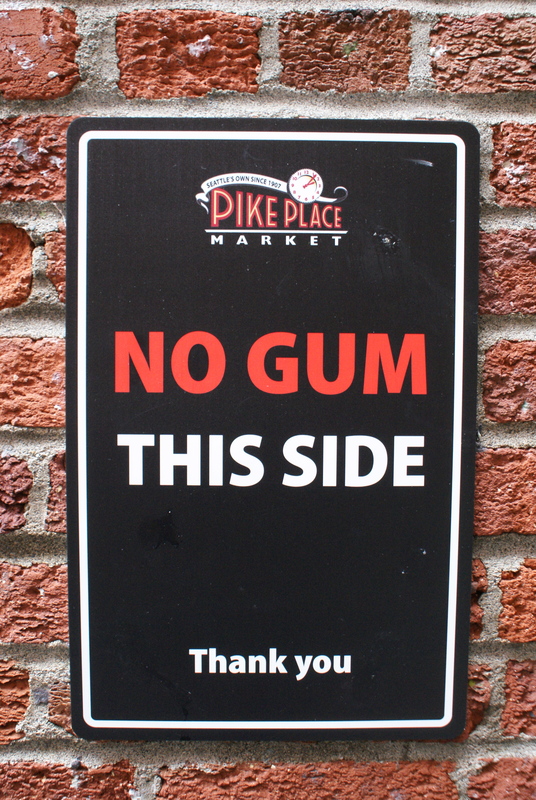 After we had wiped our fingers off, Jen gave everyone a piece of gum to be used at our next stop – the infamous Gum Wall. 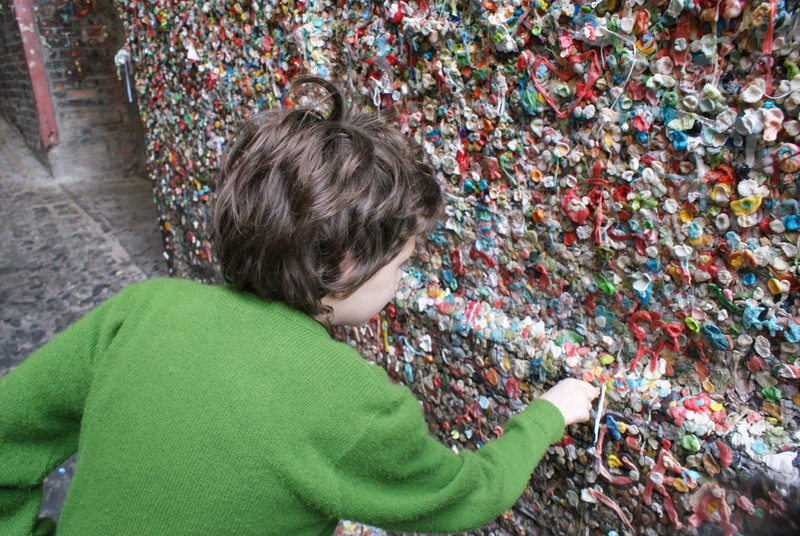 Back many years ago, this theater had such a problem with gum inside that they asked patrons to leave their gum outside, so folks stuck it to the wall, and now the whole wall is covered several inches deep in sticky, colorful gum. We learned that it is the second germiest place in the world – the first is the Blarney Stone. We did our part and added to the sight, being careful not to touch anyone else’s contribution. 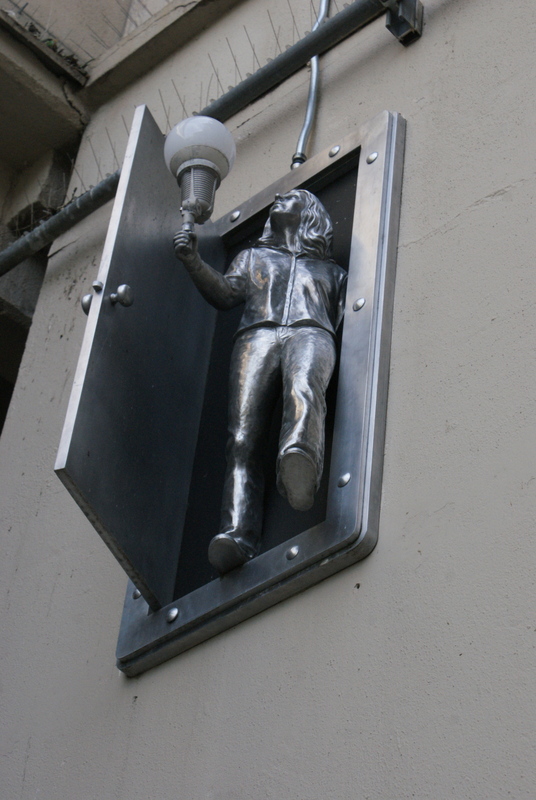 We continued on through the labyrinth of hallways and stairs, down to our next stop – but along the way Jen pointed out some amusing light fixtures on the walls. Then it was to the Bug Safari! 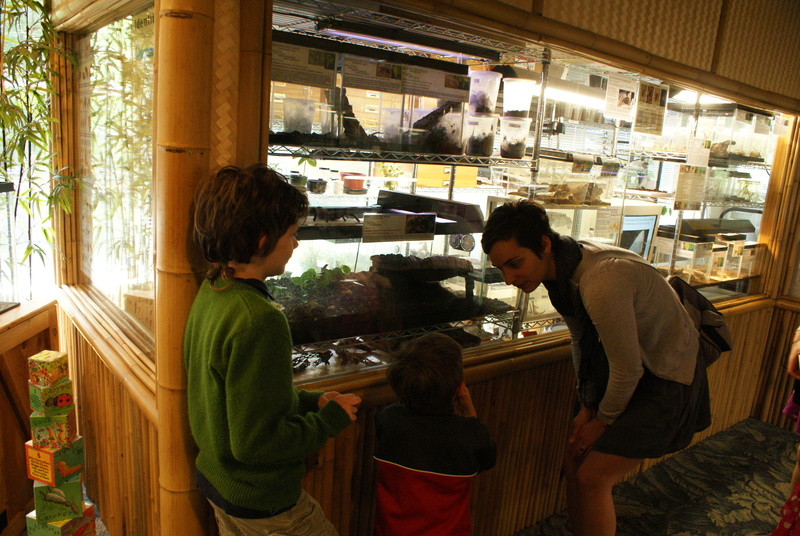 We got to go inside and see the bugs and arachnids on display. The kids loved this part – some of the moms, not so much. 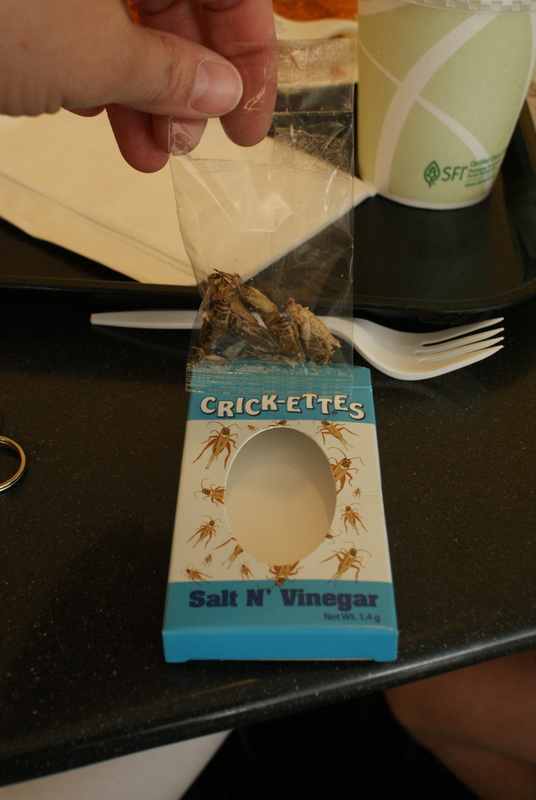 In the gift shop I picked up a couple of things for the kids, including a box of salt-and-vinegar-flavored crickets for Annika. She has been talking about eating bugs ever since we went to the Burke Museum last year and saw them in the gift shop there. She really wanted to try them, so I tucked them away until lunch time. After this, we left the Market and moved up the street, passing by a funny little hat shop, and entered the Seattle Art Museum lobby. 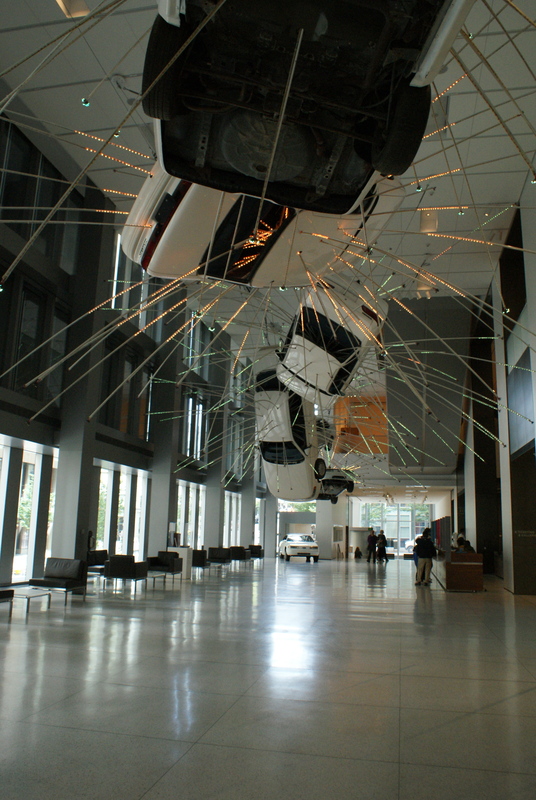 We walked through the front portion, and Jen told us what the cars were all about – they are supposed to depict a stop-motion sequence of the car exploding. I never knew that! 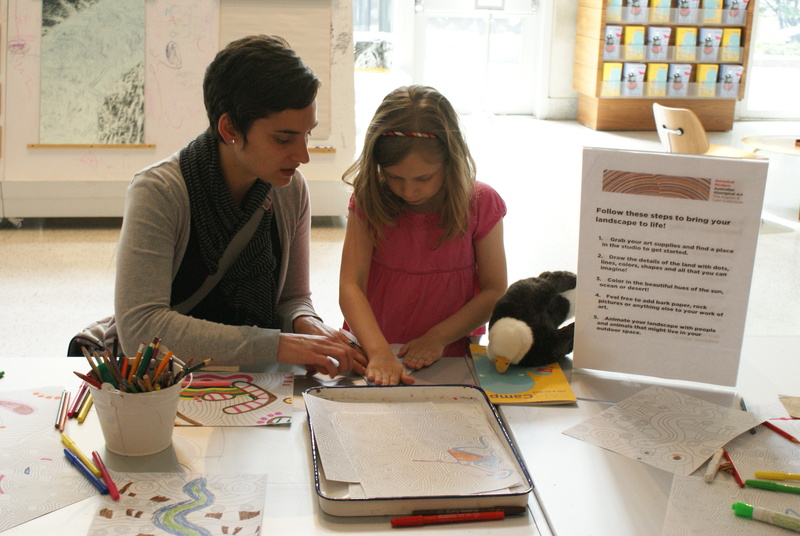 I also didn’t know you could go up the south side of the museum to the art space for kids and use it for free. 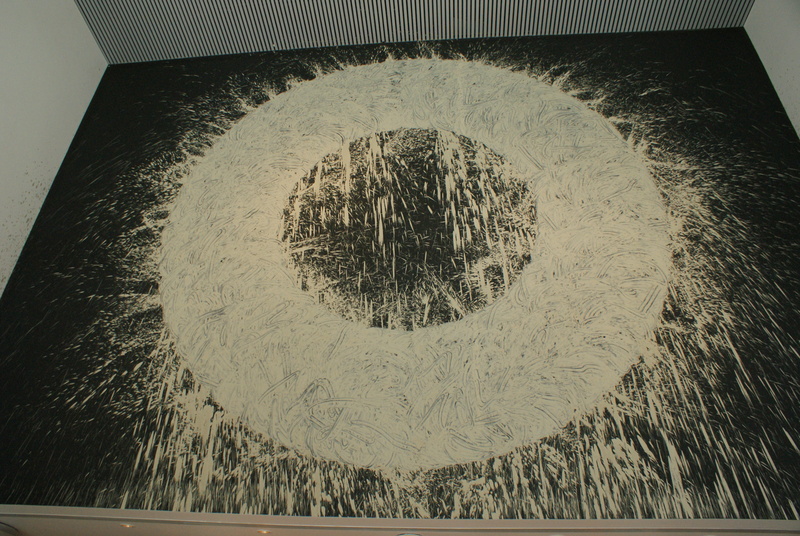 We spent a bit of time there creating, and Jen told us about the giant “O” that is painted on the wall above it. It was painted by hand with mud taken by the bucket full from Elliot Bay, and you can see the splatter marks on the walls next to it. The museum folks didn’t tell us that when we went for a class last winter in that very area. Jen was so great, she even helped Annika make a paper airplane. And then all the other kids wanted one. Alas, we couldn’t spend too long there, because we had more to see. Out the door, we gawked at the giant Hammering Man, and Jen told us about the number that is painted on his leg, as well as the days of the year he gets off. 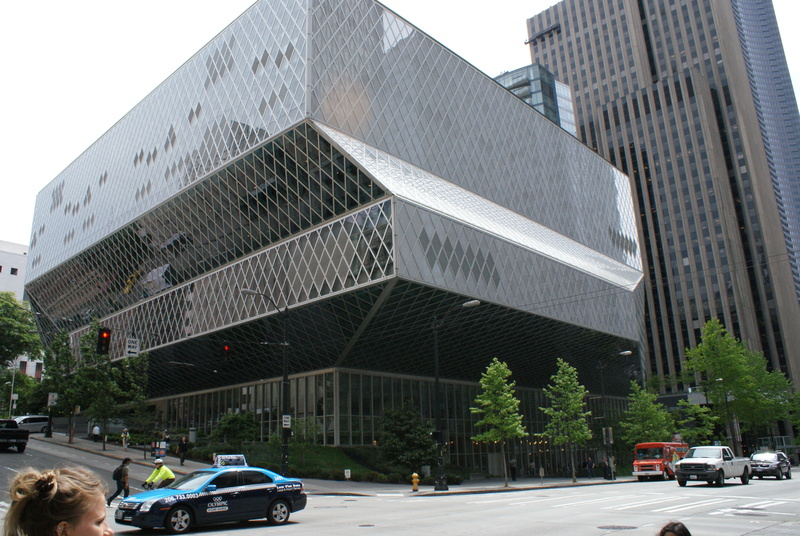 Then we hiked up the hill and over a few blocks to the Seattle Public Library. Along the way, Jen told us about art and architecture, history and culture, all doled out in kid-friendly bites that helped even this decades-long resident of the Emerald City appreciate my surroundings even more. I was embarrassed that I hadn’t been in this funky building yet, so was pleased to get to go on this day. 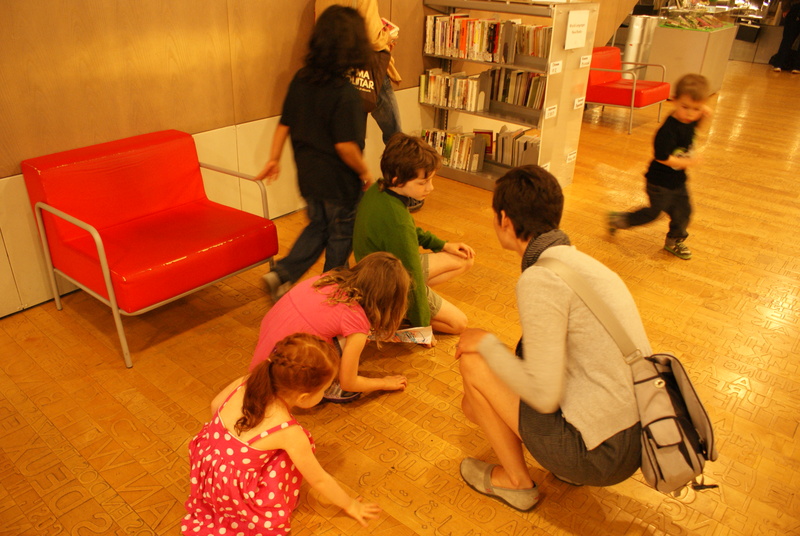 Both my kids were interested in the architecture and all the books and art inside. 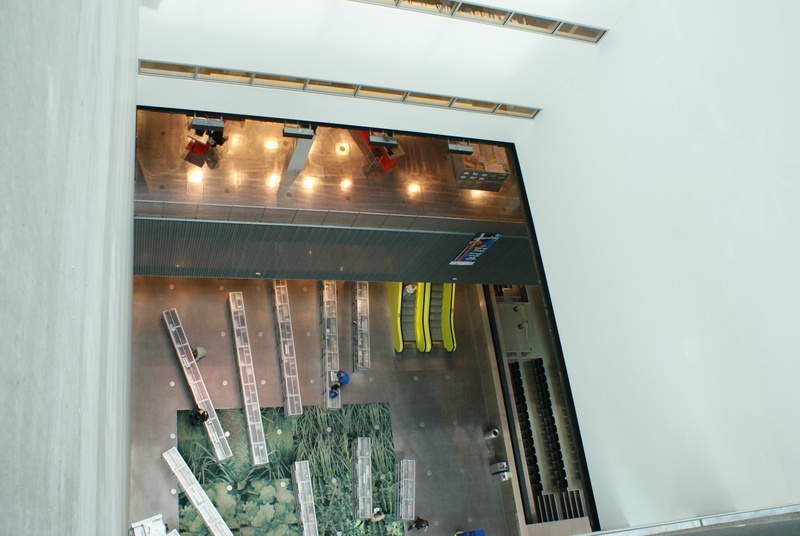 Jen took us up to the top floor where you can look dizzily down on the lower floors. 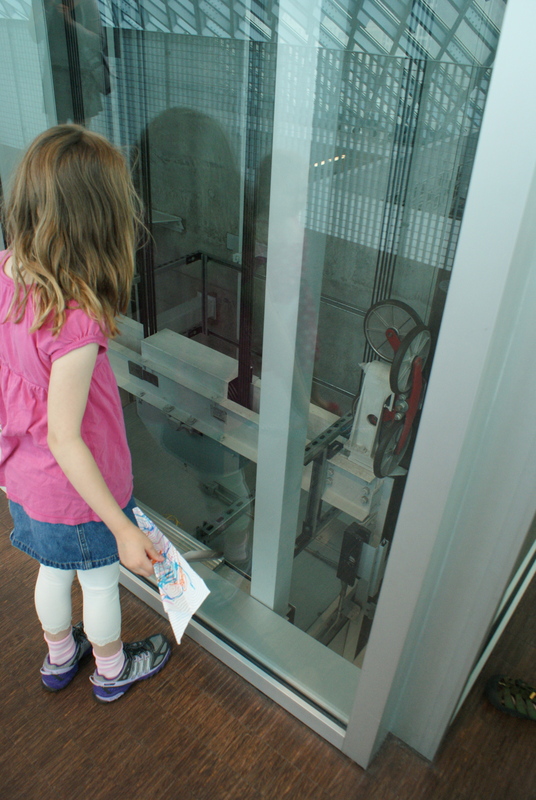 The kids also really liked getting to see the machinery of the elevators. 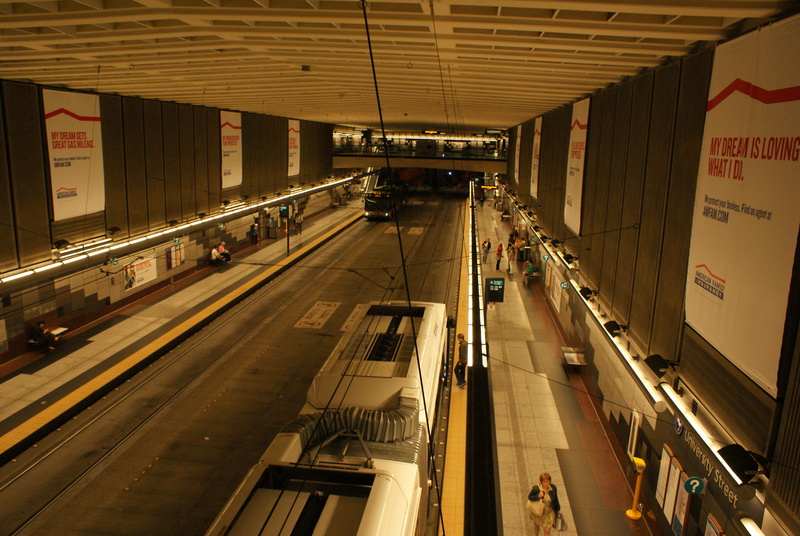 From there we walked back a few blocks to the bus tunnels, got on a bus and rode one stop to Westlake Center. 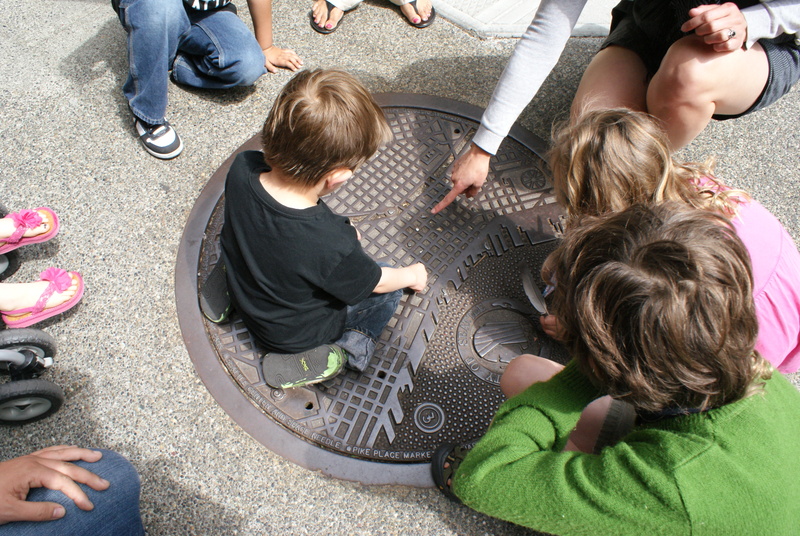 Of course, tunnels and busses are some of the kids’ favorite things. We had one last stop, a chocolate store, where we got a little treat before saying goodbye to everyone. Actually, then we all decided to go upstairs and eat lunch in the food court, a pleasantly yummy experience for eating out. The yummiest part (not really!) was trying Annika’s crickets. I have to admire this girl, she ate the whole box except for the two that Gabriel and I tried. It wasn’t that bad, but not something I would choose for a snack. She’s adventurous, I’ll give her that. 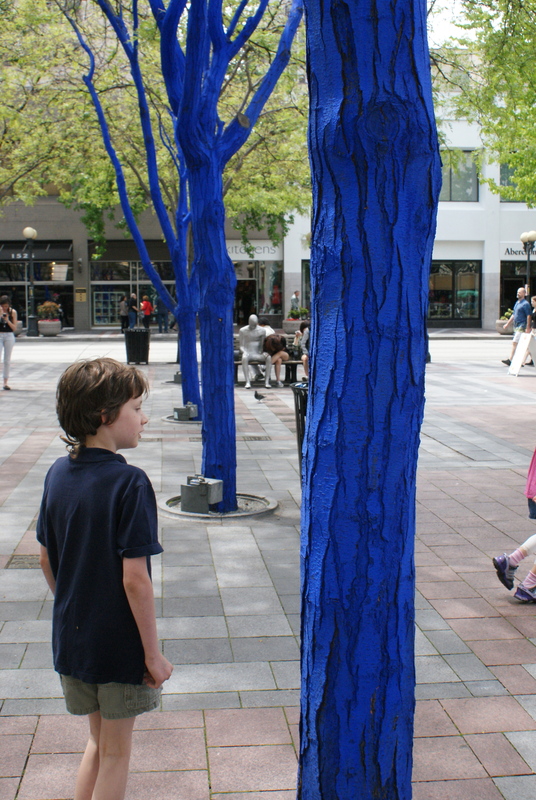 We finished out our day in the city by checking out the blue trees in the plaza outside Westlake. Then we caught the bus back home, and Daddy picked us up at the Transit Center. I highly recommend this tour for locals and tourists alike. Though initially I thought the price was a bit steep, ($25 for one adult and child, $10 for another child), there are freebies, snacks and surprises along the way, and I believe it is a good value. Our guide was completely professional and yet really knew how to interact with kids (I could see the effect of her years of experience as a preschool teacher). 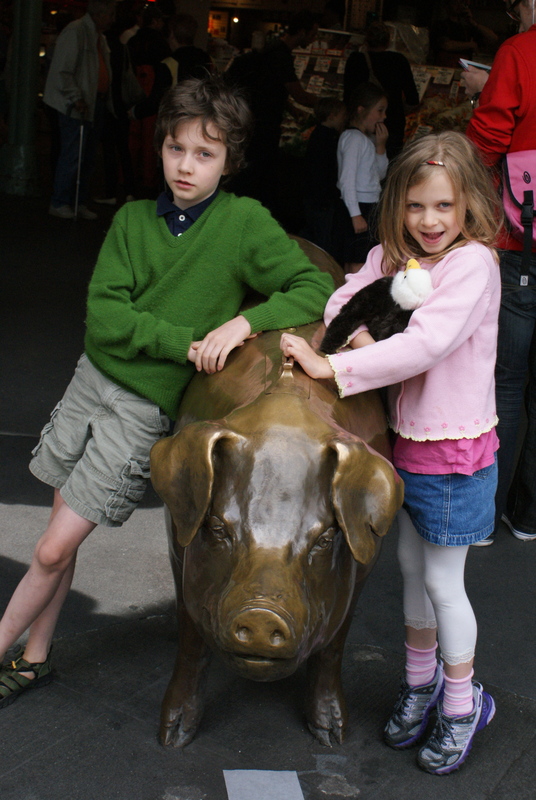 I was impressed by the owners’ enthusiasm and passion for showing kids our wonderful city. 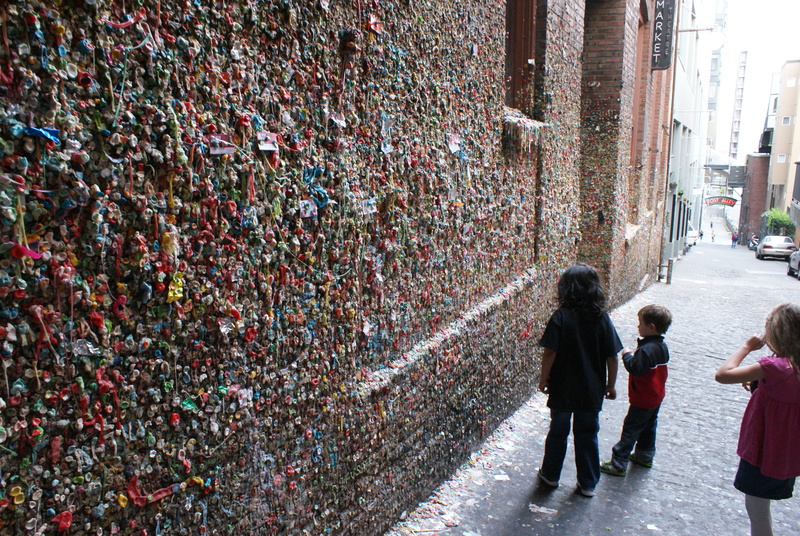 Both my kids want to go again, and I am looking at Seattle By Foot’s other tours for a future date with my husband. Tours last a bit more than two hours. Destinations for the tour change depending on the day of the week. 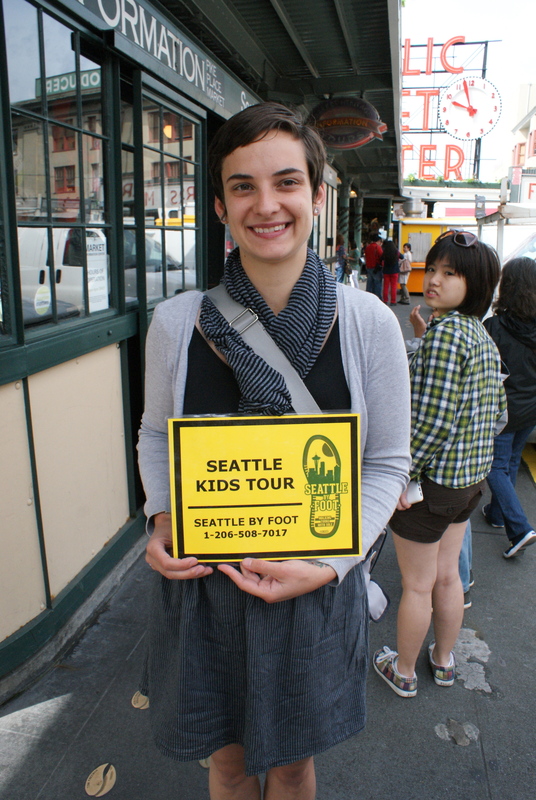 Our tour met at the entrance to the Market, next to the information booth on Pike and First. You will want to use public transportation to get down to the city, or find parking in a lot, as the street parking in the area is limited to 2 hours. Consider leaving the stroller at home; on the day of our tour the elevators in the Market were broken, and there are many sets of stairs and escalators to navigate. There are bathrooms conveniently located throughout the tour. You’ll be outside for most of the day, so dress in layers and comfortable walking shoes and bring a rain coat or sun hat if the weather is wet or hot. You can find more information about Seattle By Foot at their website, seattlebyfoot.com.